It's amazing how something so small could cause such a big commotion. Puppy #5 arrived yesterday. I called her Xena because she has what looks like a huge muscle (it's actually a hematoma) and I was hoping that by giving her the name of a Warrior Princess, she'd live up to it. Ashley called to ask me if I could meet her at Starbucks to pick up all the new "stuff." There was a pen so the puppies could be confined in a big play area and not bug Sheila. There was another bed so Kimba could get her own bed back. There was new dog food. Xena was the runt who got attacked by her 10 siblings, which necessitated the litter being broken up into smaller groups. Ashley had been keeping Xena at her house while she has been on antibiotics for her infection. Ashley felt Xena had done well with her dogs and it was time to reunite her with some of her siblings. She handed me this tiny package. 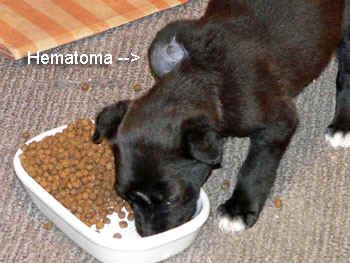 She's about 2/3 the size of Curly and has a shaved shoulder and this huge hematoma. She also was shivering a lot when I held her, so I stuck her inside my jacket, like I had done Fudge when I went to get his medicine. She stopped shivering. We loaded everything into the car and I headed on home. A committee--Sheila, Kimba and Curly--greeted me at the door. They immediately could smell Xena and were curious. I gave Sheila and Kimba their treats and began to take Xena out of my jacket. Curly immediately attacked her, even before I had put her on the floor. The other puppies were sleeping. I don't know what would have happened if all four had been awake. Xena wandered around the house, Curly on top of her the whole time. I've seen him wrestle with the other three, and I've never seen him treat any of them the way he was treating Xena. When the other puppies woke up, they went after her too. It was like they remembered that she was the "untouchable." After about 15 minutes of Xena trying to get away from the puppies, Sheila started going after her. Not badly, but treating her more roughly than she has treated any of the rest of the puppies. I decided to call a HALT to everything and give everybody a "time out." I put Xena in the cage, put the other pups outside, set up the pen that Ashley had given me inside, brought the pups inside and put them in it with their new bed and all the toys they like to play with and then I retreated to my office to let things calm down, figuring that once things were calm, I could start small and reintroduce the puppies to Xena, one at a time. Everybody howled, but eventually they did quiet down and after a bit I was able to let Xena out to get a look at her new surroundings. Her siblings were NOT happy that she was out and they were locked up. And, in truth, Xena was not happy to be outside when the rest were inside. They actually seemed to want to play together, so ultimately, I decided to try her in the cage and see how it would go. I should have stuck to my first instincts to do it one at a time, but with seven dogs all going at hyper speed, that was difficult. I took a video to keep a record how Xena's time in the pen went (see "Funny the Vlog" for today). It didn't go well. She was immediately set upon by the others and Curly, especially, would not leave her alone. After about 3 minutes, I could see it wasn't going to work and I took her out again. I started letting her run around the house, but Sheila followed her and kept trying to paw her, very roughly. I couldn't leave her unsupervised unless I kept her locked up in the cage, or in case I kept her with me. I tried keeping her in my office, but all she wanted to do was chew on the cords under my desk. Over the course of the afternoon, this was the only way I could be sure that Xena was going to be safe from the other dogs and not get into any trouble on her own. Ultimately, I told Ashley I didn't think it was going to work. Even if, over time, things settled down and everybody readjusted, it was going to take constant monitoring to get to that point and, frankly, I just didn't have that amount of time to spend. I also realized I was dangerously close to losing it. Somehow with the poop and the puddles and the work that doesn't get done, and the puppies everywhere and getting up each morning at 3:30 because the puppies set up a commotion at that time (whether I get up or not, I am awake at that time and can't get back to sleep), it just all began to close in and the thought of having to monitor Xena all the time was just overwhelming. By the time Walt got home, I was feeling like I wanted to run into the street screaming. I didn't admit that to Ashley, but she sent someone to pick up Xena.